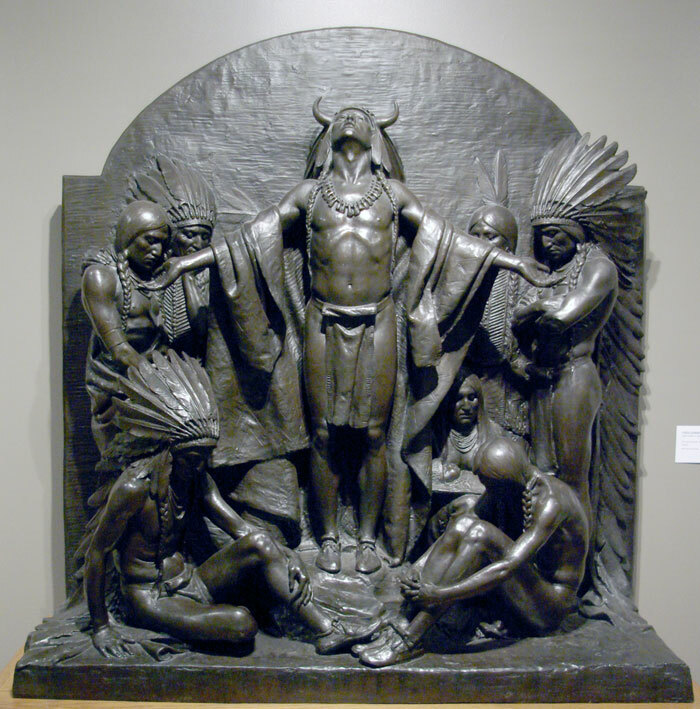 Cyrus Dallin was a famous American sculptor known for his Native American pieces and the first Angel Moroni sculpture atop a Mormon temple. 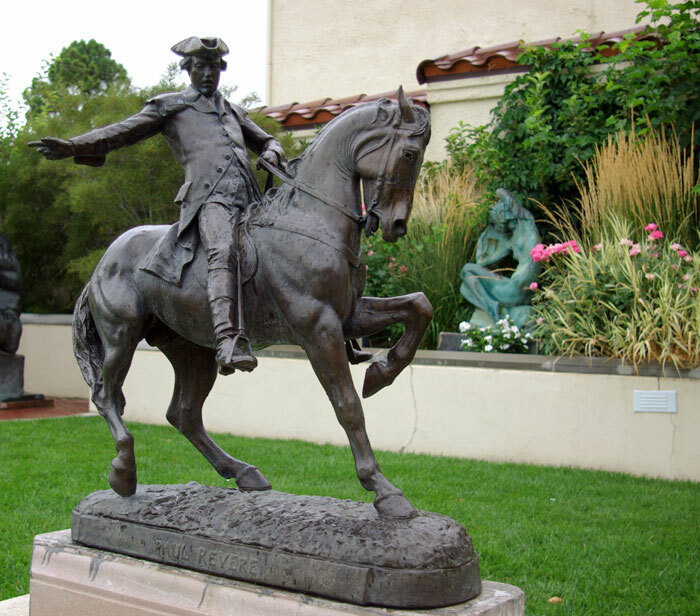 His more than 260 works include the equestrian statue of Paul Revere in Boston, Massachusetts and the Appeal to the Great Spirit at the Museum of Fine Arts, Boston. 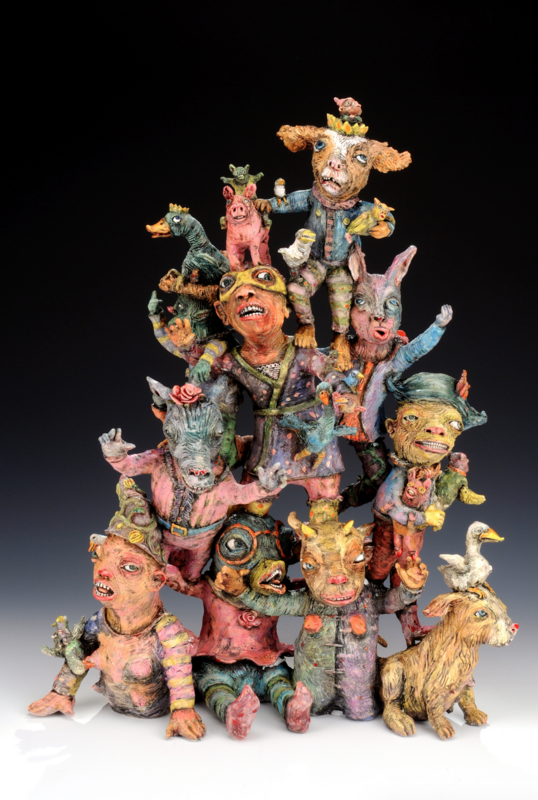 Dallin was born in Utah and more than 30 pieces of his work can be found at the Springville Museum of Art. Cyrus Dallin’s grandparents had moved to Utah after joining the Mormon Church. His parents had settled in the small Utah town of Springville, near where Dallin’s father mined, and had raised their family Presbyterian. 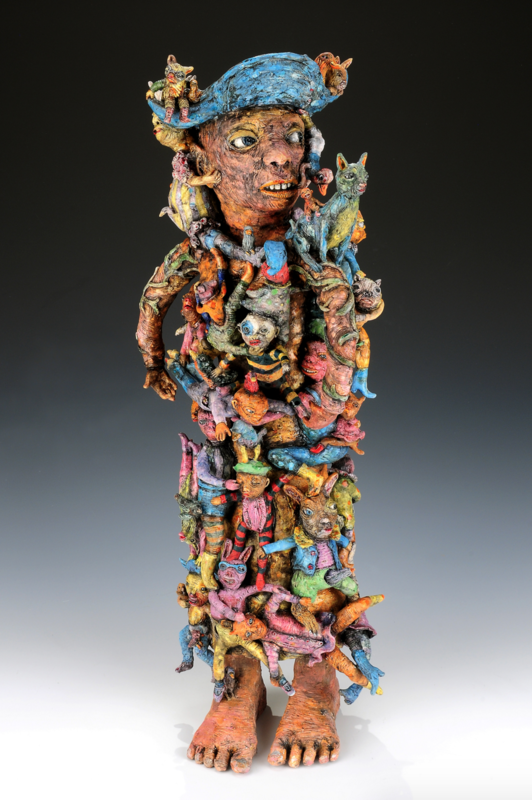 Dallin grew up associating with the children in local American Indian tribes, and first attempted sculpture by making busts of the local Indian leaders and chiefs out of river clay. 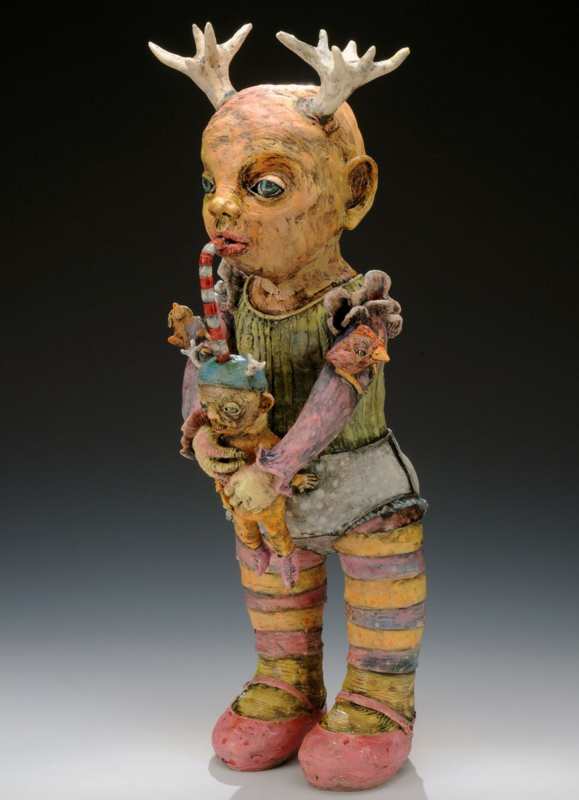 However, it was in his father’s mine that Dallin’s skills gained him recognition. 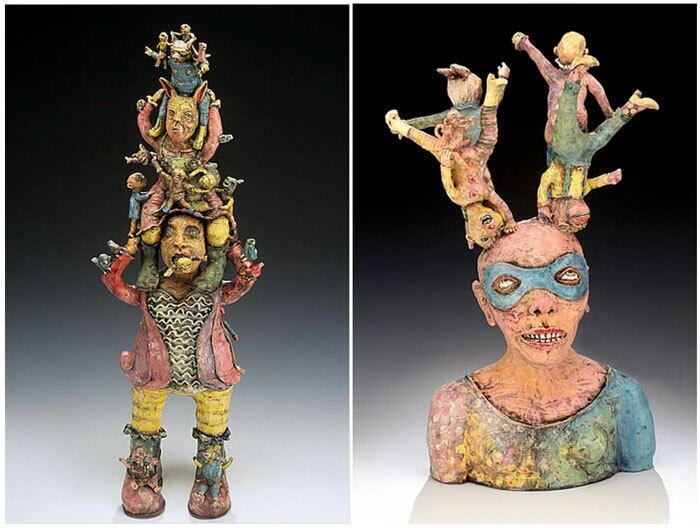 A vein of white clay was discovered in the mine, and from it Dallin sculpted busts of a man and a woman. These busts were noticed by a visitor from Boston, C. H. Blanchard; it was he who encouraged Cyrus to formally study sculpture. 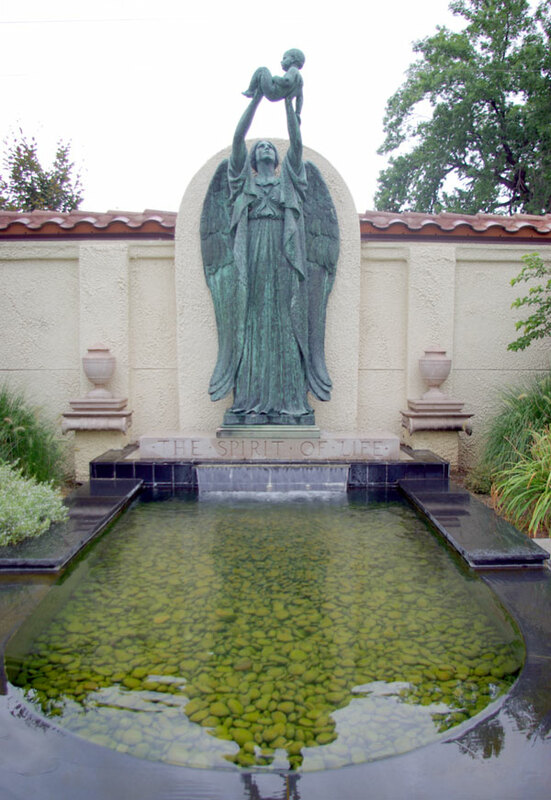 In 1890 at the age of 21, Dallin was asked to sculpt a statue for the temple. 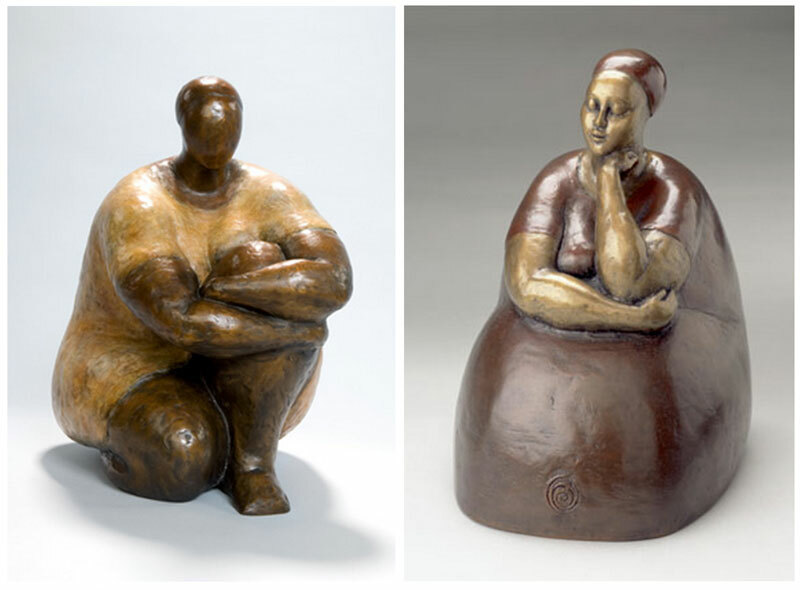 He had by this point spent years studying sculpture in Boston and Paris and had gained international recognition for his sculptures of Native Americans. 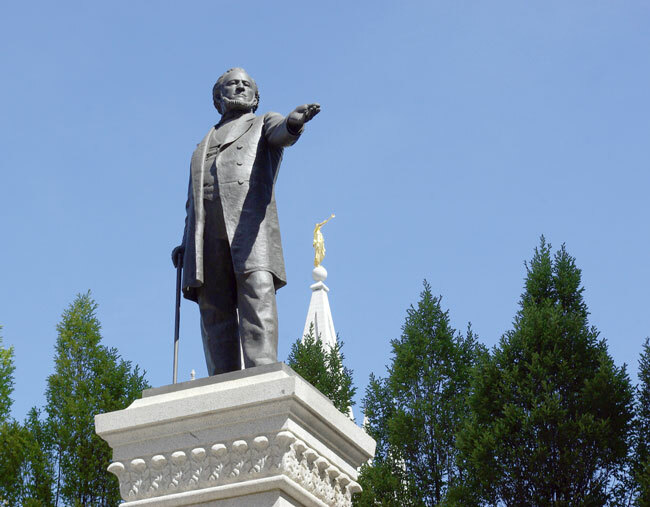 Dallin was already commissioned to create the Monument to Brigham Young that currently stands at the south end of the Temple Square Plaza when President Woodruff asked him to do the Angel for the temple as well. 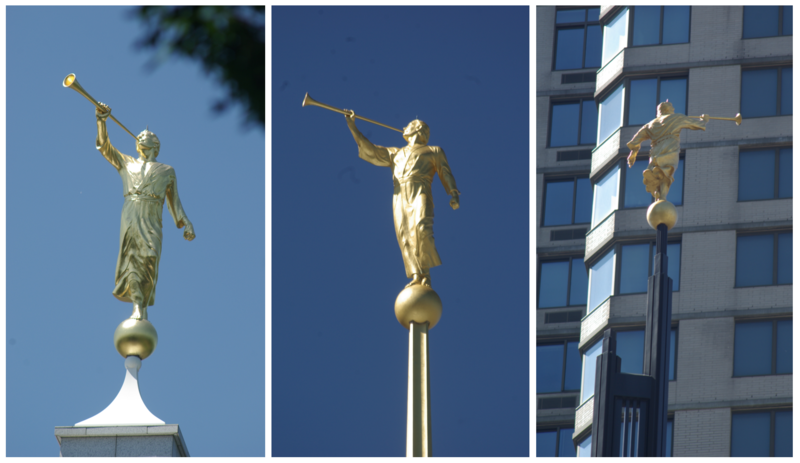 This month we are featuring a four-part series on the Angel Moroni sculptures atop most of the Mormon temples around the world. These guest posts come from Brian Olson who has spent more than 10,000 hours modeling, digitizing, and photographing Mormon temples. His free PDF entitled Know Your Moroni can be found at Photogent.com. 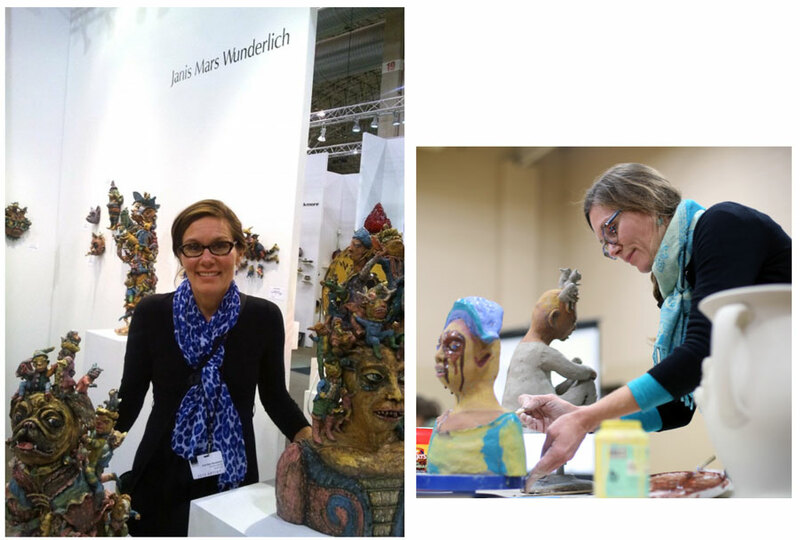 Part One profiled Creating an Icon, Part Three will profile the Legacy of Sculpture, and Part Four will look at Rendering Angel Moroni. All images courtesy Brian Olson. 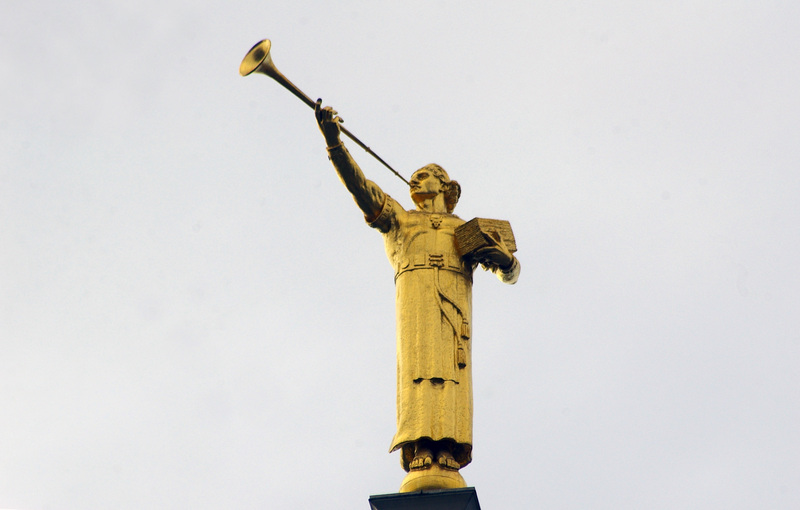 Easily recognizable to a worldwide audience, a neo-classical statue with a trumpet stands atop the tallest spire of one of the oldest structures in Salt Lake City, Utah. 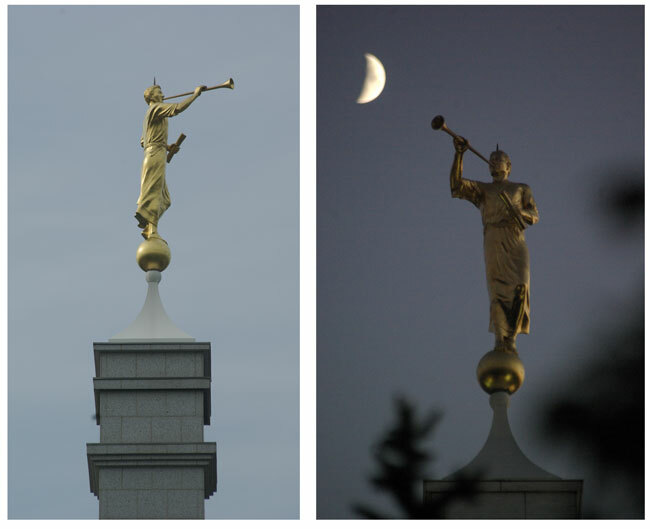 This Angel Moroni Statue and its various versions instantly denote a temple of The Church of Jesus Christ of Latter-day Saints. 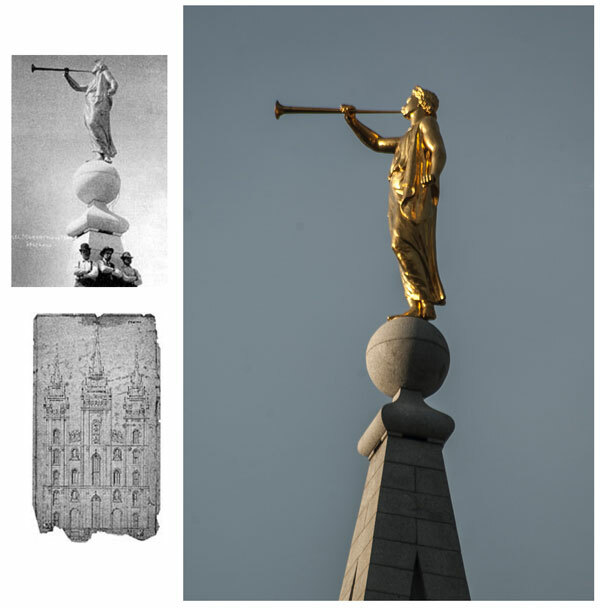 The now familiar icon was not the first form of ornamentation for the spires of Mormon temples; it would be many years before it would become a cherished and almost essential part of the temple standard. 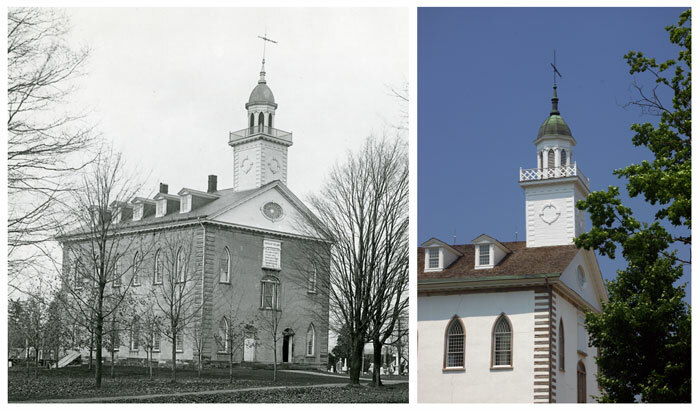 The first temple of the Church was dedicated in 1836 in Kirtland, Ohio. The temple was three stories and covered in sparkling white stucco. On top of the tower stood, not a statue, but a weathervane (below). 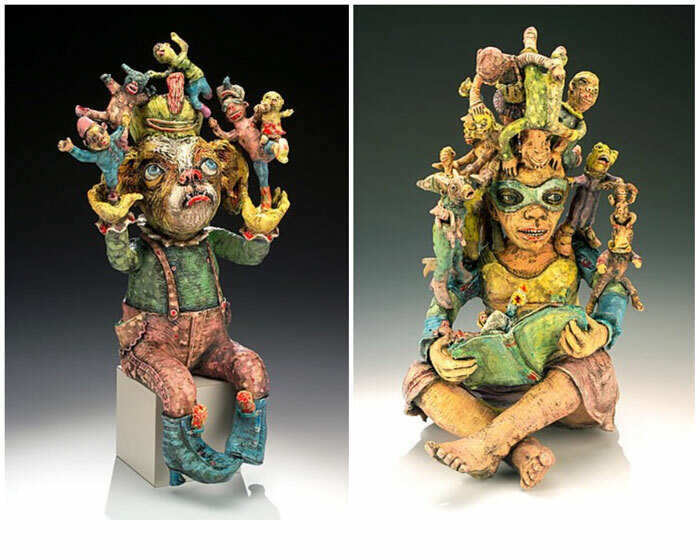 At the time, weathervanes were often placed on the tallest buildings in a community, churches, and civic buildings alike, and were of great use to communities whose industries were often dependent upon the weather for survival. 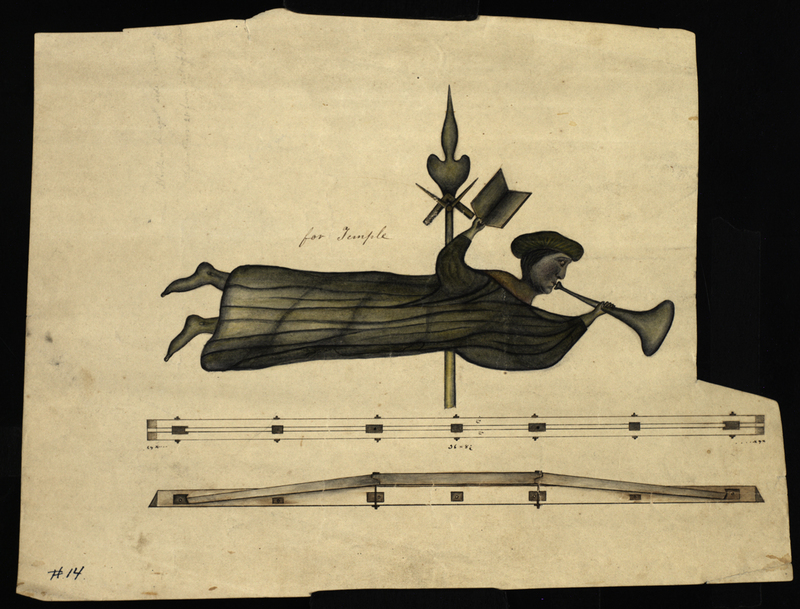 After the Mormon Church’s move to Utah, the first temples built in their new home would also have weathervanes. The Saint George temple had a weathervane on its original short tower and on its newer taller tower as well (below left). 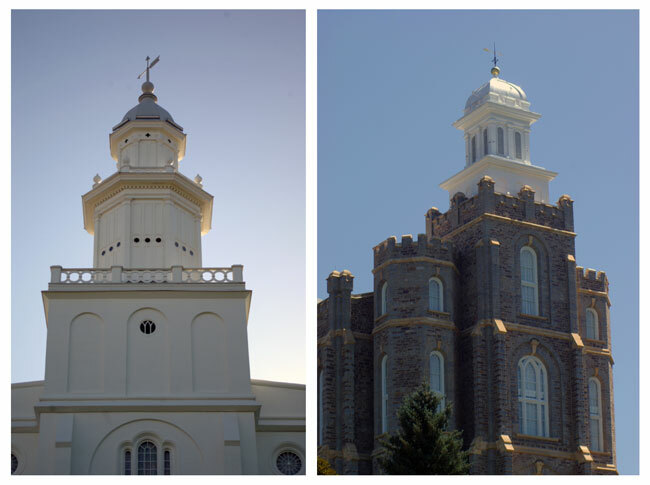 The Logan Temple was built with two weathervanes, one each on its twin east and west towers (below right). So common was the practice of weathervanes that it was not until the fifth temple was built in Manti, Utah that the Saints would break with the tradition by having neither weathervane nor statue. Weathervanes were even considered for the Salt Lake Temple. Some of the early drawings depicting what the Salt Lake Temple would look like feature the Nauvoo weathervane on both the east and west center towers. However, fashions change. 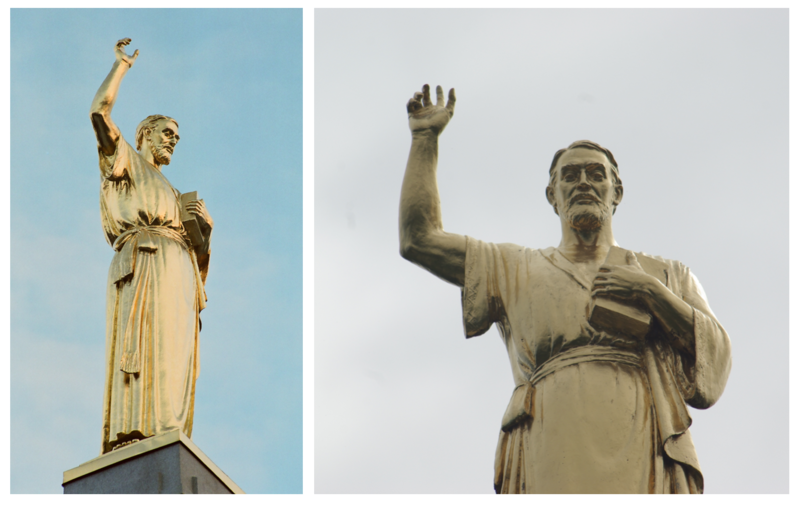 So it was that President Wilford Woodruff approached Cyrus Dallin with a commission, not for the weathervanes, but a single standing statue more in the modern style. 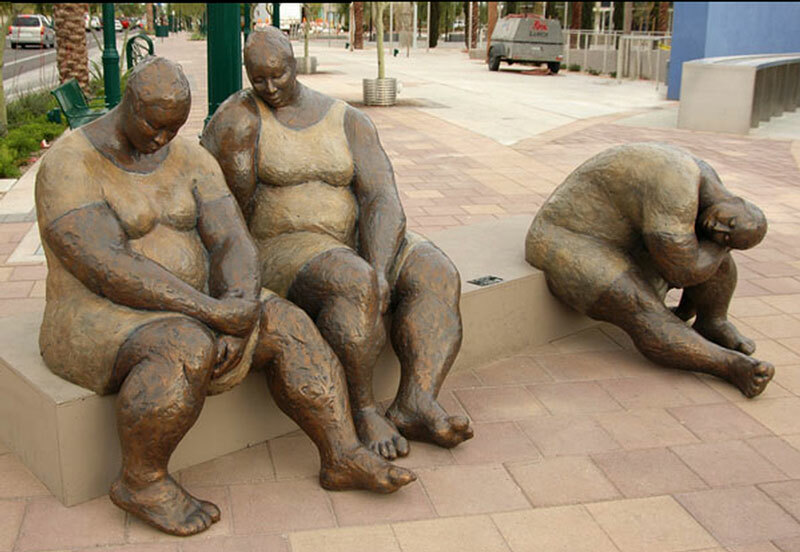 Initially, Dallin declined the commission for the statue, saying he did not believe in angels. President Woodruff persisted and asked Cyrus to consult with his mother about taking the project. Upon telling his mother that he did not wish to take the commission and his reason why, she replied “Why do you say that? You call me your ‘angel mother.’ ” Dallin accepted the commission, and it was Dallin himself who chose Moroni for the subject and inspiration of the angel (below). 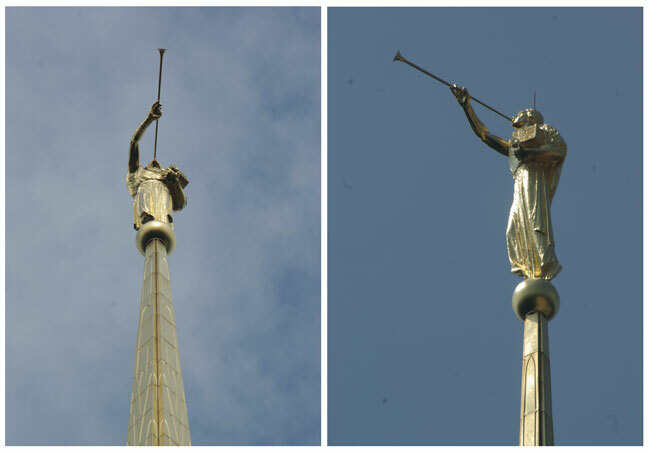 While it was Dallin’s statue that firmly linked the angel icon with the prophet Moroni in the minds of the members of the church, it was not the start of the tradition of an angel on nearly every temple. In fact, another six temples would be built and another 62 years would pass before another Angel Moroni statue would be placed on a temple. 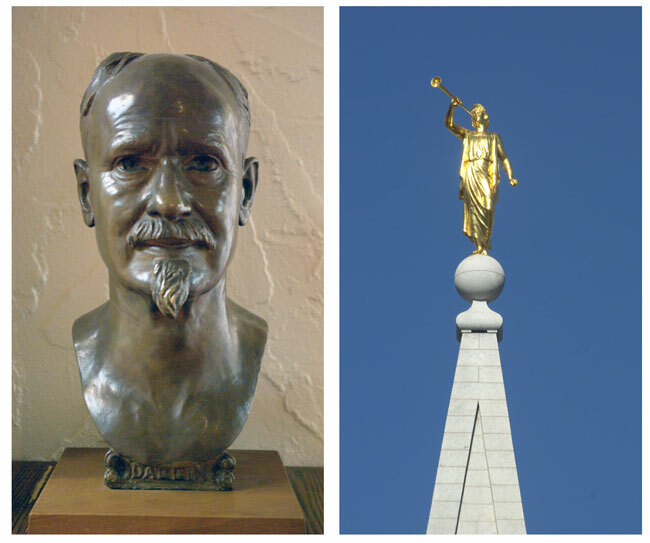 This month we are featuring a four-part series on the Angel Moroni sculptures atop most of the Mormon temples around the world. These guest posts come from Brian Olson who has spent more than 10,000 hours modeling, digitizing, and photographing Mormon temples. His free PDF entitled Know Your Moroni can be found at Photogent.com. 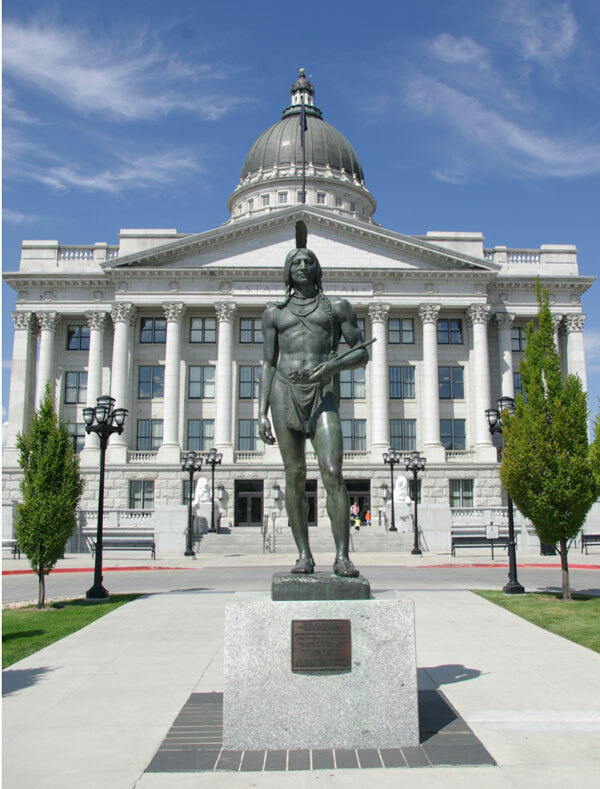 Part Two will profile Sculpting Angel Moroni, Part Three will profile the Legacy of Sculpture, and Part Four will look at Rendering Angel Moroni. Download the free PDF entitled Know Your Moroni. 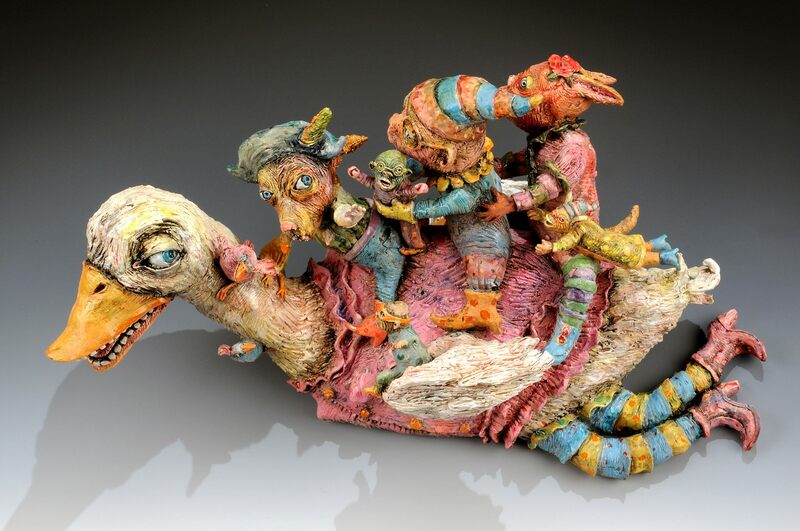 Visit Brian Olson’s YouTube page. Describe the evolution of your commercial success. 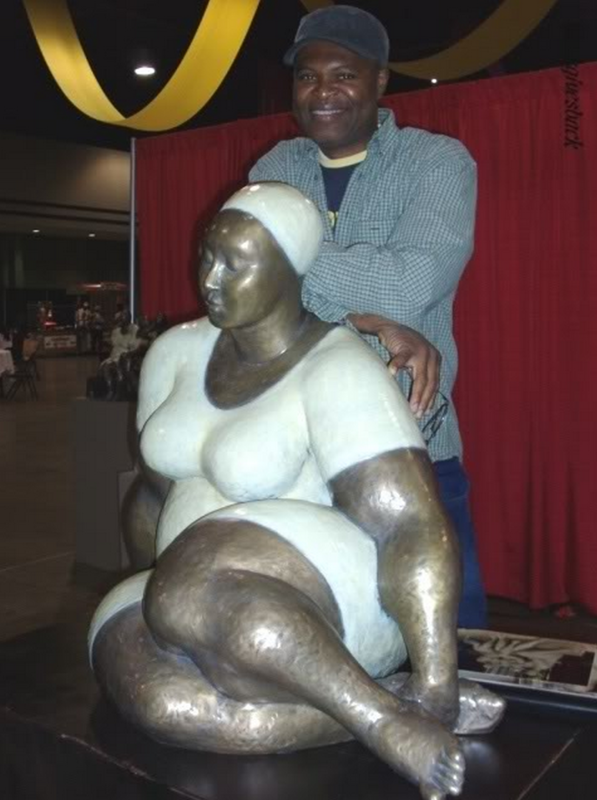 In 2004, my wife and I decided that she should quit her job and I would try to be the sole breadwinner of our home. We had just gotten back from Europe with our first child who was then two years of age, and had literally spent every penny we had on that trip. She was working as a CPA, and I was a stay at home dad. I had a home studio and I would try to work on my art as much as I could in between taking care of the baby, while she was at work. But we could see that this arrangement was working against our natural I instincts, and to the detriment of our family. She would rather stay home with the baby but was at work, and I would rather be at work but was home with the baby! 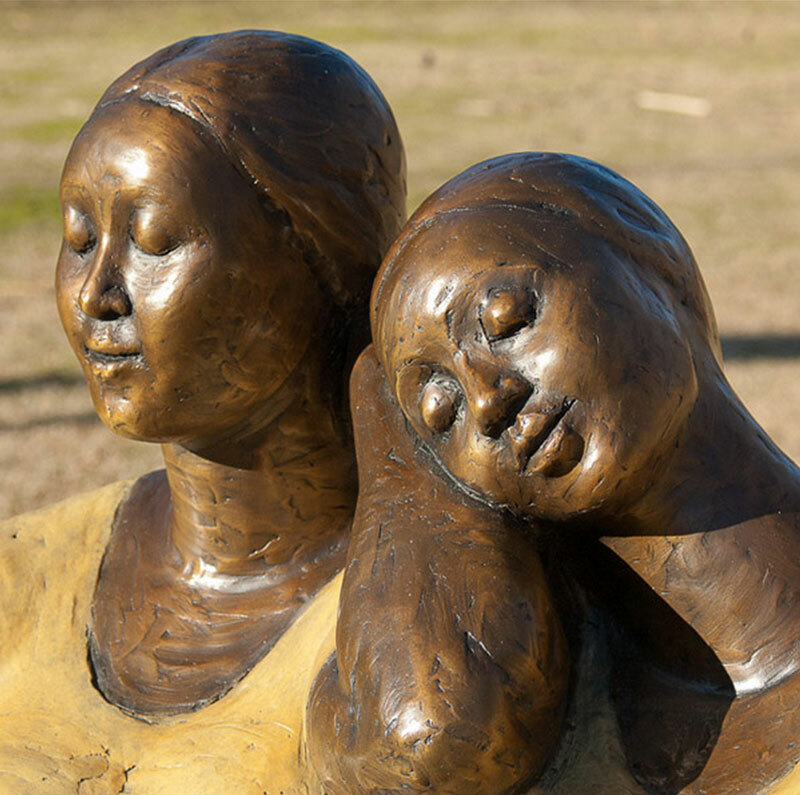 Although we were fully aware that what we felt was right for us was also in alignment with the teachings of the gospel, it was quite scary for us to give up the security of her job. However, I knew we had to take that leap of faith, believing that if we do our best that God will do the rest for us. It was time to put the things we thought we believed to the test! I’ve always felt a calling to be an artist. Even though there had been quite a few people who tried to talk some ‘good sense’ into me, I never wavered because of the strength of my conviction. I knew where my talent came from and believed that it was meant to be used and not hidden away. 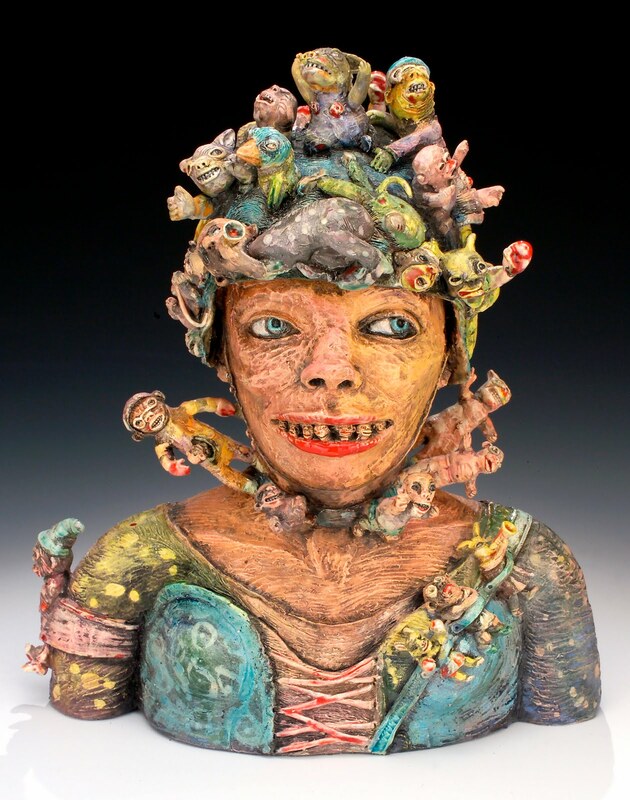 Only a sadistic and irresponsible being, and I reasoned that God was not any of those things, would give me a useless gift. How and why would He not want to help me to use that talent to make a living? The decision was made. My wife resigned from her job. Because she was a great worker, her employers did everything in their power to tempt her to stay, and to her credit, she never wavered. We have never looked back since. I now not just believe but know that all those things, which I believed, are indeed true. I have also come to learn that money is the easy part with God. What is difficult for Him is getting us to see that, and then getting us to not worry about money, but rather to preoccupy ourselves with finding out what He needs us to do for Him, and then to do it. I’ve also learned that hard work, coupled with passion, confidence, goodness, honesty and integrity, are magnetic to success. 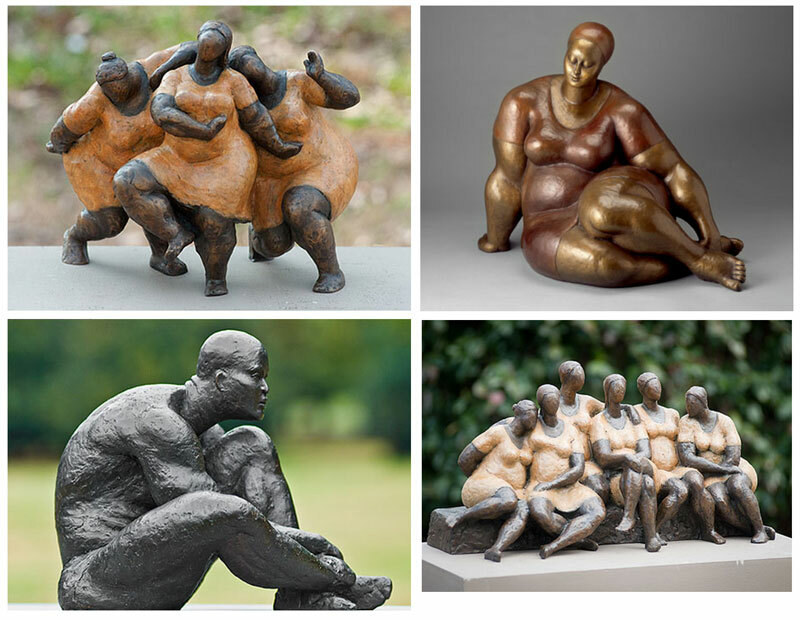 My definition of hard work has also evolved over the years. I have found out that pushing so hard does not necessarily get you where you want to be any sooner than the right time, for although hard work is necessary, it is not by hard work alone that we succeed. One of the greatest lessons I feel I have learned is that one is at his best when God is working in and through him or her. So I remind myself that the goal is not only to work hard, but it is also to make sure that I live my life in alignment with Him.